If you’re not into the whole relicing thing, you might wanna skip this story and read something else. Might I suggest this? Check out this Fender prototype of the new John Mayer relic Stratocaster, which is based on – get this – John’s Fender Custom Shop Relic ’61 Strat. Yeah, it’s not vintage like a lot of people naturally assume. So this is a relic of a relic. That’s the original on the bottom, and the copy on top. Of course this isn’t the first signature Strat Fender has made for John Mayer. When I worked at World of Music in Brighton East here in Melbourne, I had the opportunity to play a several production model John Mayer Stratocasters and one of them in particular was probably the nicest non-Custom Shop Strat I’ve ever played. CLICK HERE to see Fender Stratocasters on eBay. Next → Next post: NEWS: Fretnet returns! A reklic of a relic, even if the guitar is good, too me it says “cash grab,” all over it. Wow a relic of a relic is really pushing it. I thought I read that this was an SRV model that he modified, he must have one of those too. He’s a relic fiend! Exactly, it’s like Jon says. I respect his musicicianship but he’s “pushing” it for sure. I’m not too into relics in the first place but this is rediculous. It’s way worse than a signature artist guitar of a signature artist guitar, like all the Les Paul sigs are. I was pretty surprised to find out it wasn’t a vintage guitar. Oh well, either way I’m sure it’ll rock if it’s anything like the standard John Mayer Strat. But the ‘relic of a relic’ thing might complicate matters for Fender’s PR department. “relic of a relic”… yes and no, it’s a Custom Shop 61 reissue that was reliced. Its a chance to live an era you missed . I enjoy the kids nowadays who do the hippie thing . Car guys have covered every era of hottrodding and bike guys have been doing old school like crazy . The guitar guys are now just getting onto it ,its about time !!!! I think a lot of people have become very interested in this guitar after Mayer's MJ performance. Visits to this particular story have gone up a lot. Did you guys ever hear Mayer's guitar solo on Fallout Boy's cover of 'Beat It'? It's not a relic of a relic. 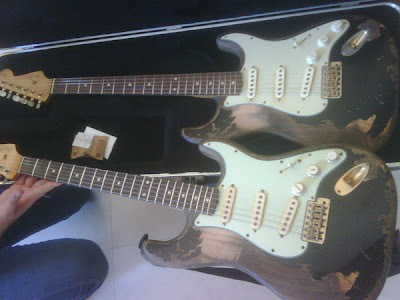 It's a strat built by the same guy in the same style as the one he built for John. you can't build a relic of a relic. Same thing as the road worn guitars they are just worn in the same places.